How cool is the Fabulous Flowers set? Way cool! This is my card I made for Beate’s weekend sketch challenge #10. I spent the evening at my upline Deb’s house playing around with some of her new goods, and this is what I came up with for the challenge. Stamps used were: Fabulous Flowers, Amazing to Zany, and So Swirly Jumbo wheel. Cardstock used: Really Rust, Soft Sky, Close to Cocoa, and Very Vanilla. Inks used: Chocolate Chip, Really Rust, Soft Sky, and Close to Cocoa. Accessories used: Hodgepodge Hardware-Pewter, Color Spritzer Tool, Dazzling Diamonds, Twill Tape, Glue Dots, 2-way Glue Pen, and sponge. Card size: standard 4 1/4″ x 5 1/2″ Really Rust with Soft Sky mat 4″ x 5 1/4″ and Close to Cocoa mat 3 3/4″ x 5″. Flowers were stamped on Very Vanilla, spritzed and sponged with Chocolate Chip, and finished with a touch of some Dazzling Diamonds to make a little “fabulous”. Sentiment stamped directly on Twill Tape with Chocolate Chip ink. Added a small tab to bottom left corner again with “fabulous” from Amazing to Zany stamped directly on the little Twill Tape tab I created. 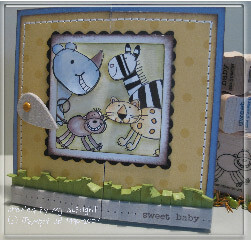 And the winner of my “Sweet Baby Gate Fold Card” featuring Zoofari stamp set is………. THAT’S RIGHT!!! ALL 15 PEOPLE WHO COMMENTED ARE WINNERS! LOOK AT IT AS YOUR LUCKY FRIDAY THE 13TH. I will be making this card and sending it out to all 15 peeps who commented! I work weekend night shifts, so I will get busy on these some time next week! Thanks for helping my site grow!! I am approaching 2,500 in blog hits. I know… That’s not much & just a small number compared to some I see…yikes ya’ll !!! To show my appreciation, I’m going to raffle off this “Sweet Baby Gate Fold Card” I made a couple weeks ago with the Zoofari set. Just leave a comment, your name, and ENTRY # ….that’s all! And this beauty could be yours. My 3 year old son will be my randon entry number “picker”. Winner will be notified as soon as I reach 2,500. I used the monkey from Zoofari, and the sentiment is from Polka Dots & Paisley set. 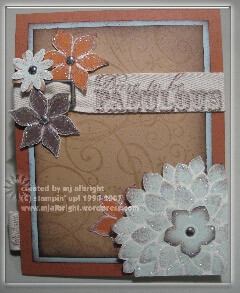 I also used Linen BG stamp on the Certainly Celery piece of cardstock. Cardstock used: Chocolate Chip, Certainly Celery, Groovy Guava, Purely Pomegranate, and Whisper White. Inks used: Chocolate Chip for watercoloring, sentiment, and sponged to edges, Stazon Jet Black, Stazon White sponged to edge of Chocolate Chip card base, Uniball White gel pen for faux-stitching. I picked this little guy because he is simple and I could still do some watercoloring. I added the grass to this card (so this must be a fad I’m having right now…but it’s just so cute to me). Added a simple flower to left side of sentiment made with spring bouquet flower punch and attached to card with a silver brad. Scalloping around Circle created with 1/4″-circle punch (this is going to be the hold up for finishing the cards…don’t have the scallop circle punch yet). Whisper White Circle: 3rd inner circle with Coluzzle Circle Cutting System. Also used to create the Certainly Celery grass layered on top. This is a pop-up stand-alone card. I added dimension by having sentiment on front, cutie pirate in middle, and treasure chest in the background. This card folds flat. When Pirate middle tab is pulled, the sides slide down and forms a base. First, thanks soooo much for all the comments regarding my work. I appreciate the replies. It’s like free therapy … instantly uplifts and makes me happy to read responses. I never thought I’d hear what I’m hearing about my work. Bare with me here – my husband has been the person who gives my creations a thumbs up or down. He has always been supportive and stays neutral with his constructive criticism. 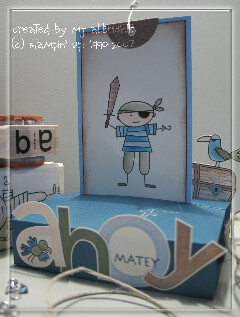 I already have approx 45 Ahoy, Matey Pop-Up cards (I couldn’t make any more of those) that you can view on my scs gallery. I read posts about demos taking somewhere around 600 cards…..wow! I can’t do those kind of numbers. Maybe 200. I will post what I come up with in the very near future. Again, thanks for all the kind words! So cool. I’m glowing. I made this Joy Fold Card with the intent for it to tell a story (kinda). 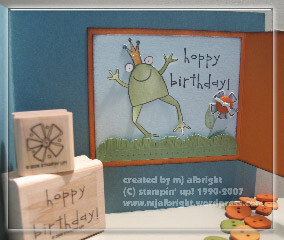 Like a childs story where the prince charming is a frog and going to hop on by with some b-day wishes. This card was made for Beate’s weekend sketch challenge #9. 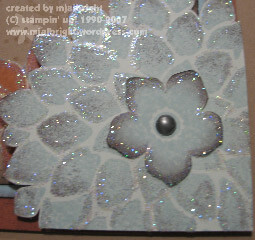 You can see a full tutorial and card size details at her blog site. I found inspiration for this card from the new collection book. Colors were taken right from the front cover. I just love the grass on pg.77 ….so my style! I used Unfrogettable, Double-Line Doodles, and Polka Dots & Paisley stamp sets for this card; Cardstock used: Blue Bayou, Wild Wasabi, Soft Sky, Pumpkin Pie, and Shimmery White; Inks used are same as cardstock plus Jet Black Stazon ink. Edges are sponged with Chocolate Chip. Chipboard from On Board Blossoms & Basics covered with Pumpkin Pie cardstock and paper pierced each scallop. 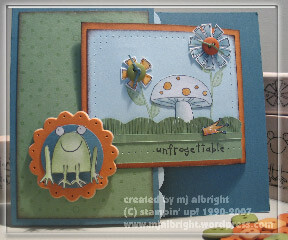 Used 1-1/4″-circle punch for Blue Bayou beneath froggie. Frog is stamped on Shimmery white and water colored Wild Wasabi with Aqua Painter. Grass was made with patience! There is a base piece approx 1″ x 3 1/4″ with many many close cuts (like in collection book). I couldn’t resist scalloping the grass to add the the fairy tale. I added a thin strip measuring 1/8″ x 3 1/4″ to top just to give more dimension. I have the crown laying in the grass till it’s b-day wish time (inside of card). Buttons were used for flower centers. I used very thin cardstock strips of Blue Bayou, Wild Wasabi, and Soft Sky for my button threads. For inside, Frog has gone from sitting (on cover) to hopping with the crown now his head…not in the grass…sending b-day wishes. Grass and flowers continued to inside. Again, see Beate’s blog for tutorial on Joy Fold Card dimensions.